Juugo is the largest member of "Snake." He is mentally unstable, sporadically fluctuating between a bloodthirsty and a docile personality. While in the former mindset, Jugo attacks anyone around him with the intention to kill, sometimes determining which gender he will kill first during conversations with himself. It is because of this uncontrollable drive for blood that Jugo, while docile, consents to being confined since he doesn't want to hurt anyone. 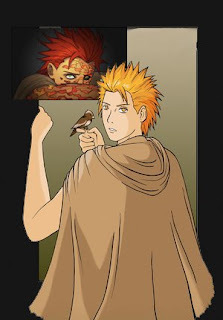 Kimimaro was able to control Jugo during his outbreaks, allowing him to assume a somewhat natural lifestyle where he viewed Kimimaro as a friend. After hearing that Kimimaro sacrificed his life for Sasuke, Jugo agrees to accompany him since he believes that Kimimaro's spirit continues to live on in Sasuke.